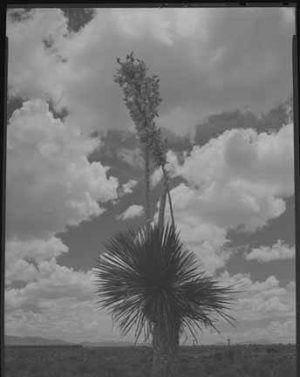 "Black-and-white photograph of a flowering yucca in Southwestern New Mexico," photograph, Palace of the Governors Photo Archives Collection ( HP.2007.20.256). Palace of the Governors Photo Archvies, New Mexico History Museum, Santa Fe. 2004 The Zunis and the Raw People. Zuni, Indians of North America, Heritage Edition. World: 15,000 Years of Inventions and Innovations. New York: Facts On File, Inc.